ZillowLeona and Harry Helmsley were indicted for claiming as business expenses things they purchased for this lavish home. The Greenwich, Connecticut, summer home where hotelier Leona Helmsley died has been completely renovated and is back on the market for $65 million. The mansion was at the center of the tax evasion scheme that landed Helmsley in jail in the 1990s. The case took Helmsley and her husband, Harry, from glamorous to notorious as the case played out in the press. Helmsley was dubbed the "Queen of Mean" and famously was quoted as saying that "only the little people pay taxes." The billionaire couple were indicted for claiming as business expenses things they purchased for the 17,493-square-foot brick estate, which sits on 40 acres on Round Road, one of the most famous parts of Greenwich. Among the luxuries they added to the home: a marble dance floor above the swimming pool, a $45,000 silver clock and $500,000 worth of jade art objects, according to The New York Times. After Helmsley's death, her Greenwich estate was originally listed for $123 million, but several price cuts led to its eventual sale to the current owners, for $35 million. They listed it soon after buying it, for $42.9 million, then took it off the market and set to work renovating the 1918 estate from top to bottom. They tore some of it down (the home is 3,000 square feet smaller than it was when they bought it) and modernized it considerably. They also restored original teak floors and limestone walls and fireplaces, and added new technology, appliances and equipment. The tile roof was removed, restored and put back on. The estate has views of the Long Island Sound and luxurious touches such as the freestanding, oversized bathtub in the master bathroom. 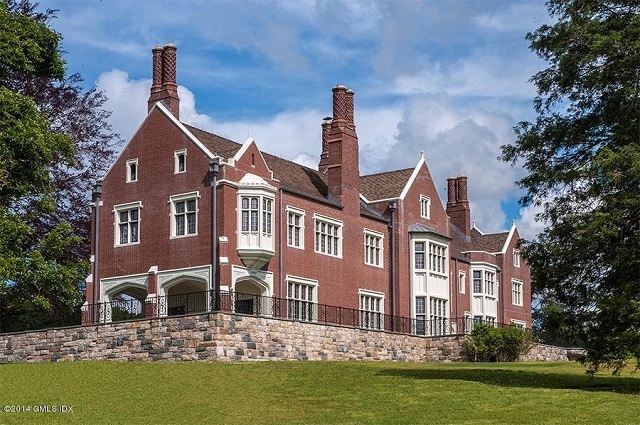 The listing is held by Jane Howard Basham of David Ogilvy & Associates, part of Christie's International Real Estate.